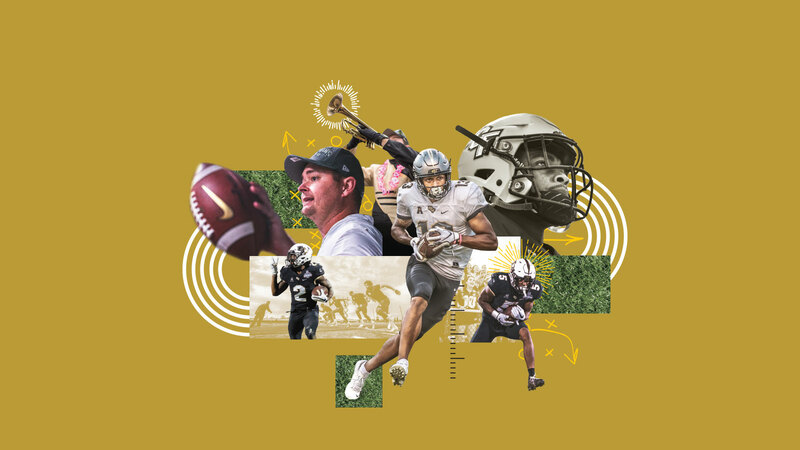 UCF Announcer Marc Daniels on Football Team: "Only the Beginning"
Marc Daniels on the UCF football team’s incredible past two seasons and the promise of the program’s future. As the final seconds ticked down at the Fiesta Bowl, coaches, players and fans had a sinking feeling they had not known for two years: the possibility of an impending loss. Was this it? Was the team’s 25-game winning streak really over? Is this how the improbable, thrilling, wild ride ends? Not a chance. After two perfect regular seasons and a lifetime of memories, I believe this is only the beginning. UCF is just getting started. Only two years ago, the Knights entered the season hoping to improve on a loss against Arkansas State in the Cure Bowl. And when the wins began to pile up, people took notice of “that team in Orlando” and how the Knights played. Those performances took UCF to a major bowl game and a 34–27 win against Auburn in the 2018 Peach Bowl. Many media outlets covering college football felt UCF should enjoy the attention on the national stage they earned with an unbeaten year and go quietly into the off-season. But UCF has never been about doing the expected. UCF has always been about striving to be bigger, better, bolder and groundbreaking. And the 2018 season shined a brighter spotlight on this team and this university. After two perfect regular seasons and a lifetime of memories, I believe this is only the beginning. UCF is just getting started. From the moment Coach Josh Heupel took the reins last year, he and his staff understood this past season was an opportunity to show that the 2017 season was no fluke, and that UCF was ready to claim its place among big-name college football teams. Yes, there were doubters and critics who lined up to mock UCF and their place in the college football landscape. But week after week, the football team grew stronger and focused on Coach Heupel’s game-by-game mantra: Go 1-0. And that’s what this team did. They showcased an even faster offense. They introduced us to new playmakers on both offense and defense. And they proved that adversity is only a challenge to find a way to make things happen. Many said we couldn’t beat Pitt, and yet we won the game 45–14 by dominating on both sides of the ball before a packed crowd at Spectrum Stadium. Some thought we wouldn’t be able to turn around a 16-point deficit against Memphis on its home turf. And yet in the pouring rain and facing 4th-and-1 at the team’s own 29, UCF went for it and senior running back Taj McGowan raced 71 yards for a touchdown, earning the Knights a 31–30 win. Many said we wouldn’t recover after losing quarterback McKenzie Milton to an injury, and yet we saw a group of young men rise up against USF and then again against Memphis, earning the Knights’ fourth AAC championship title in six years. The streak reached 25 and another major bowl game awaited. And all along as the season unfolded, UCF became a polarizing brand. Almost everywhere you looked, listened or read, someone had an opinion about UCF. The success of this team led to a national debate about the current format of the College Football Playoffs and what teams are included. No voice was louder than Danny White’s, UCF’s athletics director. He took on all challengers and continued the fight for a better system and a stronger reputation for UCF. And by the time the season marched into December, he found he was not a chorus of one. Commissioners, college presidents, former coaches and even a few members of the media said they believe the time is right to rethink the playoffs and who has a chance to earn the title on the field. Even though the streak has ended, it has been a magical ride for UCF. Our athletics department is bigger and growing stronger each year. Our football program has a great coach, an outstanding staff and a group of players who have built a culture of excellence and an expectation to compete for championships and play with the best in the game. And our president is committed to continue UCF’s trajectory to be among the leaders in education and opportunity. So while a scoreboard in the Arizona desert closed a special chapter in the history of UCF football, the story is really just beginning. UCF football’s future is bright. There are more big games to win. There are more conference titles to earn. There are more memories to be made. The team is here to stay — today, tomorrow and well into the future. 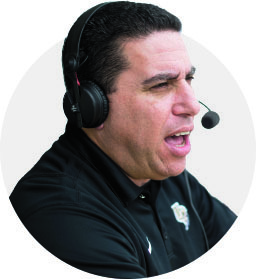 Marc Daniels is the director of broadcasting for UCF Athletics and has been the Knights’ radio play-by-play announcer for 24 years. The 2019 PlayStation Fiesta Bowl marked his 293rd consecutive football game with the team. He is also the host of 96.9FM/740AM’s The Beat of Sports, a daily sports and entertainment show.